Ten years ago, there were no web chats, no apps, no social media hype and limited interaction via email. In contrast, more than 35% of interactions happen via social media today. This shift in customer preferences toward a faster, comfortable service system has led increasing numbers of companies to business process outsourcing (BPO) to contact centers to meet customer requirements effectively and efficiently. Contact centers are the central point in an organization that manages all customer contacts. Once you decide to outsource, it is important to analyze various factors regarding the contact center industries based on your business specifications. Have you honestly evaluated the size of your organization and what your specific needs are? Business owners often end up outsourcing to the wrong-sized partner which can be detrimental to the company. For example, if you anticipate an audience of 50 to attend a show and rent an auditorium with the capacity of 500, you be at a loss due to unused (but paid-for) capacity. Similarly, if you invited 100 people to a dinner, but ordered food for only 50, a high percentage of your guests is likely to leave unsatisfied. There is an all-too-common perception that only the “big” BPOs offer good services. One tends to believe that bigger the organization, the better the service – a notion that often misleads business owners into making decisions based on perception instead of reality. In fact, mid-sized to smaller contact centers are not only capable of providing robust and effective services, they tend to strive harder toward achieving goals when compared to larger contact centers. These contact centers are also usually more open to providing customized solutions to address your specific needs. Large contact centers are certainly impressive and can offer larger capacity. If your program requires thousands of agents, then you may require the resources and man power these organizations can provide. However, you may be at risk of being treated like a “small fish” in a large contact center environment if your program requirements are more modest. In addition to being able to provide more personalized attention and service to your program, smaller contact centers invariably achieve better results because their business culture fosters higher levels of employee engagement. Great service comes from effective teamwork and adequate training – and teamwork comes from building strong relationships which is often lacking in larger teams. Contact center employees need to treat your customers as if they are their own. It has been observed that smaller the contact center, the more vested agents are in focusing attention to smaller processes. With attention to details, they ensure higher customer satisfaction and push to perform better as they progress. At the end of the day, customer satisfaction is the most crucial part of your business. To meet this objective, you need to research the company well before you make them your partner. Inquire about their past records and goodwill. Irrespective of the size of the contact center, they need to be able to deliver adequate results. 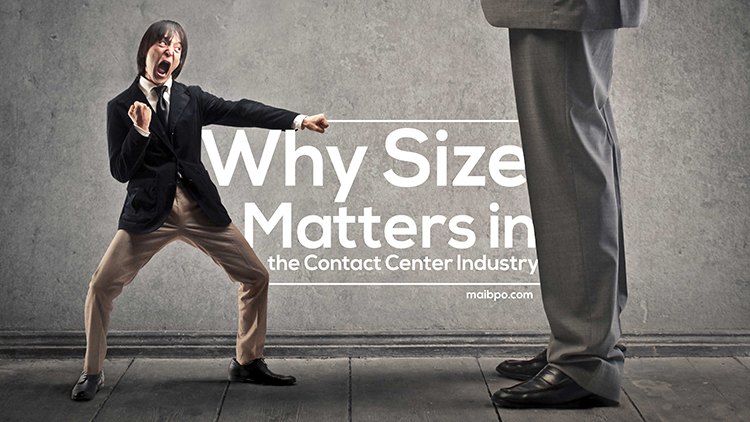 So does size matter when it comes to choosing a contact center? It definitely does! It is one of the most important factors to consider in the beginning of your search. You might end up investing more than the expected outcome or vice versa. So roll up your sleeves, choose what is best for your company and do not allow the “bigger is better” notion to cloud your judgment.